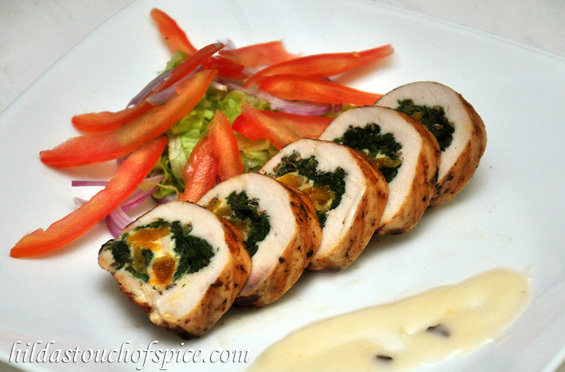 Chicken Roulade is so simple, easy and fun to make. You can use a variety of your favorite cheese and stuffing to make it interestingly creative. You can add an element of savory and sweet fillings to boost the flavor with great taste. This roulade is a perfect nutritive meal with the goodness of olive oil. 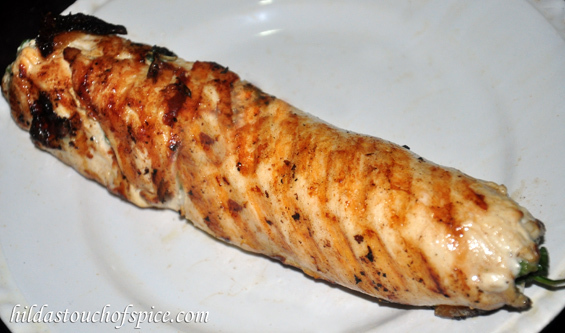 I made this gorgeous Chicken Roulade which looked spectacular when sliced. The lovely fresh green of the spinach and the bright orange of the dried apricots looked so pretty. We admired it for awhile before we relished it. The Chicken Roulade was succulently moist and delicious. It tasted wonderful with a simple crunchy salad and a light mushroom sauce. Place the chicken breast into a Ziploc bag or between two sheets of plastic wrap/cling film. Beat the chicken breast with a meat mallet until it flattens and is as thin as possible but it should not tear apart. (about 1/8 inch (3 mm) thickness). Repeat with the other breast after you complete stuffing the first one. Stir fry lightly minced garlic with olive oil in a pan. Then add the blanched spinach, salt & pepper to taste and toss gently for a few seconds. Transfer to a bowl to cool. 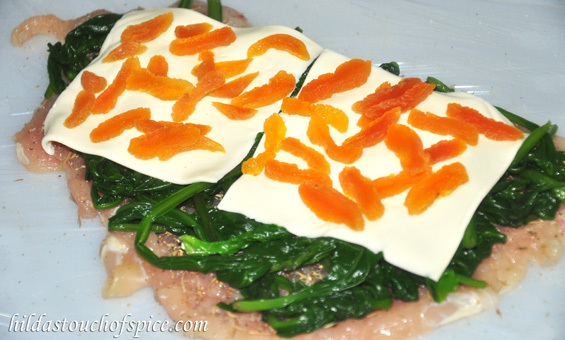 Spread and arrange uniformly the blanched spinach on the chicken breast. You may chop the spinach if you like. Next, arrange 2 cheese slices and then the chopped apricots as seen in the picture. Roll the stuffed chicken breast from the wider side with the help of the cling film to form a cylinder; just as you would a Swiss roll. Make sure you are gentle and the stuffing is intact. Try and make the roll as tight as possible. Set on a plate with the seam side down. Repeat the process for the other chicken breast. Place in the fridge or chiller to firm up. Heat a grill pan and very lightly brush with olive oil. When the grill pan is very hot; very gently place each prepared chicken cylinder on the grill pan with the seam side touching the grill. Grill for about 2-3 minutes on each side before flipping. Grill on all sides uniformly. Brush with olive oil to retain moisture. Gently transfer the grilled chicken roulades on a tray. Let them rest for about 5-7 minutes. This step is very important to get neat slices. When ready to serve, slice with a sharp knife into ½ inch slices. Arrange gently on a platter. Serve with a crunchy salad and your favorite sauce. You can use cheese of your choice. Select stuffing as per your preference. You can bake or grill in the oven or steam or poach. I prefer grilling on a grill pan to get the awesome grill marks. Awsome. You are a super chef. Love your recipes. Happy new year.